This is another martial arts flick with weapons and it's a pretty good one at that, just isn't great. Mainly it's because the story is sort of flat although all over the place at times. But I liked the comic book style of this movie and since it works sometimes. 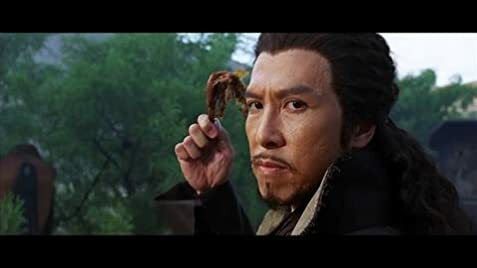 The title of this movie is the weapons that Donnie Yen's character carries around with him in a wooden box, but they mostly all look generic. Although each weapon has it's purpose, but you can't tell which weapon is which while watching for the most part. Also the 14 blades isn't even used in a special manner, it just seemed like regular swords for the most part. It would have been cool if it showed each weapon with a distinctive different look and style of fighting to it. But that just doesn't apply to this movie for the most part. What starts out as a bit over the place plot while being somewhat interesting quickly becomes a romance movie between Donnie Yen and Zhao Wei's characters. However the fight choreography is done really well in this and doesn't come off as being super lame to watch or anything like that. It seems like Donnie Yen's talent is increasing with every martial arts movie he is in. The set pieces are well crafted as well and if the plot carried it's own weight as well, this would have been a great martial arts movie. At one point, what is unquestionably a bundle of dynamite is used, although dynamite was patented in 1867 - 223 years after the end of the Ming Dynasty during which this movie takes place.